I am in love with this card! I feel like I could make hundreds of these for all occasions!! You all know how I love Black and White. I did want to add a pop of color with the ribbon but then I thought I would keep it basic…..and I just couldn’t figure out which color to pick. I will be making tons of these in an assembly line. That is the fastest way! For this card, I started with a Whisper White card base. I cut a piece of Basic Black measuring 4″ x 5-1/4″ and a piece of Whisper White measuring 3-7/8″ x 5-1/8″. On the piece of white, I stamped the floral image from the Timeless Textures Stamp Set. The best way is to stamp it randomly……start anywhere you wish and then move to the right and up and stamp again. Then stamp again to the right and lower. This gives sort of a cross pattern….or however you would like to call it. Once it was all stamped, I adhered it to the Basic Black. I wrapped a piece of Basic Black Satin Stitched Ribbon around the card and tied it into a knot. 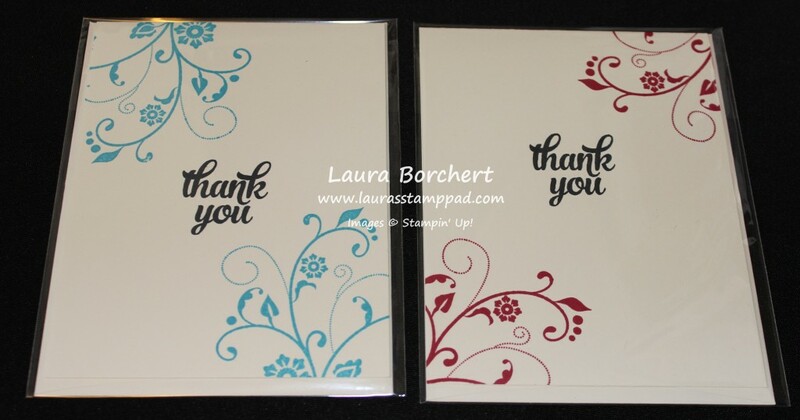 I added this piece to the card front with Stampin’ Dimensionals. For the greeting, I used the Teeny Tiny Wishes Stamp Set and stamped in black onto white. I punched it out with the Large Oval Punch! 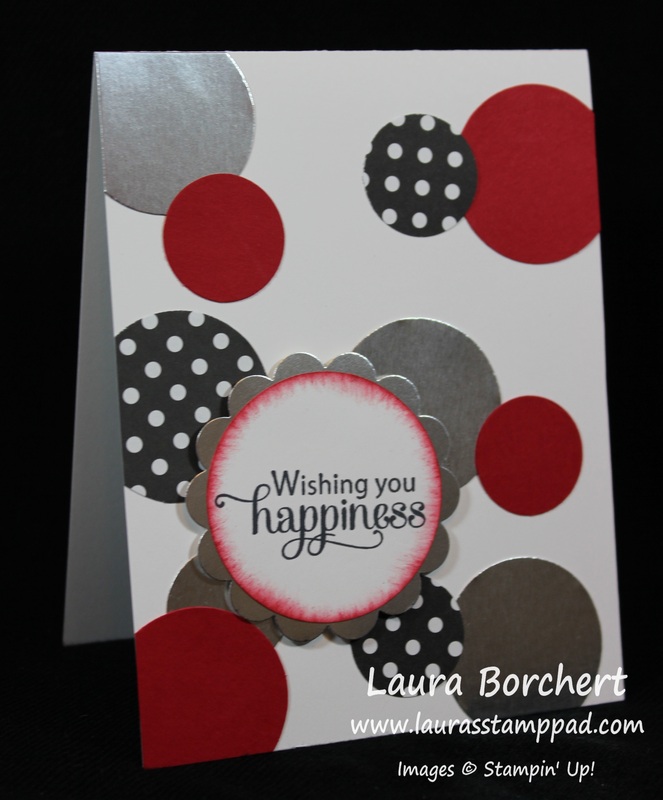 I layered it onto black Scallop Oval Punch and adhered it to the card with Stampin’ Dimensionals! When I add a piece to my card that has texture like embossing or ribbon, I like to use Dimensionals because they fit into the grooves. What occasion would you use this card for – Wedding, Anniversary, Birthday, Sympathy or something else? Let me know in the comments below! You all know I’m loving the Rose Wonder Bundle! Here is another fabulous sample using the Rose Wonder Stamp Set and coordinating Rose Garden Framelits (Bundle & Save 15%)!! For this card, I started with a Whisper White card base! Then I took a piece of the Love Blossoms Designer Series Paper (3-7/8″ x 5-1/8″) and layered it onto Smoky Slate (4″ x 5-1/4″). This gives a very small border but still sets it off and makes it stand out more. Then I placed a piece of Silver Satin Ribbon across the middle of the paper and wrapped the ends to the back before adhering it to the card base. For the greeting, I stamped the frame image from the Rose Wonder Stamp Set in VersaMark Ink and poured Silver Embossing Powder over the top. I set the powder with the Heat Tool and let it cool before die cutting it with the Rose Garden Framelits. Then I stamped the greeting in Blushing Bride in the center. I also die cut out two flowers with the Rose Garden Framelits in Silver Foil Paper. I added the flowers to the card front with the Fine Tip Glue Pen and the greeting with Stampin’ Dimensionals! Love it! You can check out other samples using the Bundle here, here, and here! More samples using this Designer Series Paper Stack can be seen here, here and here! This wedding invitation is all about elegance and shine! It is just stunning in person when you can see the beauty of the Silver Foil Paper and Silver Glimmer Paper! This invitation was very basic to create. 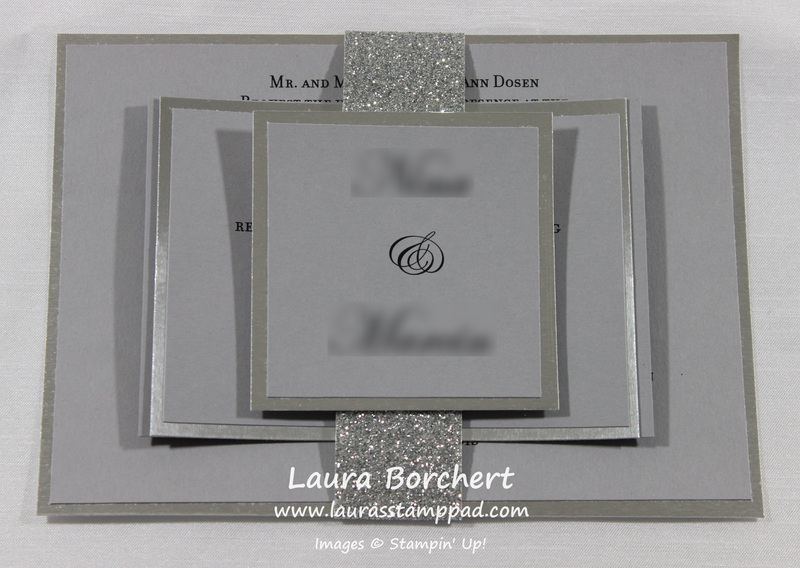 I did all of the printing on Smoky Slate Cardstock – Invitation, RSVP, Reception Card and Belly Band. I layered the Invitation, Reception Card and Belly Band onto Silver Foil Paper! For the Belly Band, I cut Silver Glimmer Paper into 1-1/2 strips. I actually cut one strip of 1-1/2″ x 12″ and then rotated 90 degrees and cut the rest of the 1-1/2″ strips. Those strips measure 1-1/2″ x 10-1/2″. This way you are using every little piece of the Glimmer Paper! TIP: the glimmer paper goes together best with a hot glue gun! Unfortunately I don’t have any tips for containing the glittery mess. I did use the Simply Score Tool to score the belly band and make the folds easier. After I was all finished, I rinsed this off with water to clean it up. Here is a small glimpse of my craziness when I am creating wedding invitations. 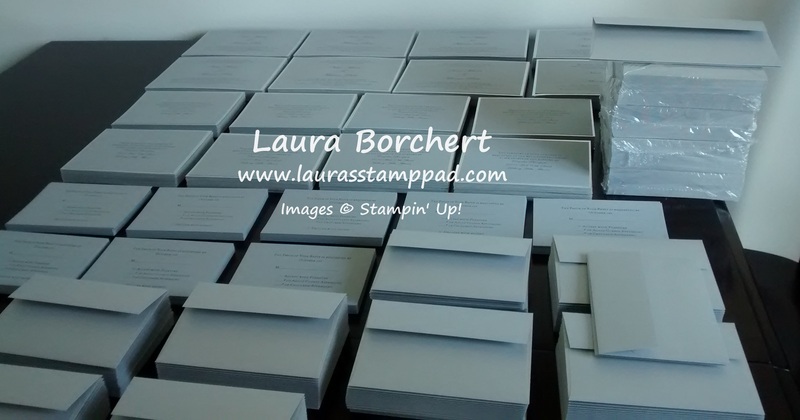 I probably count each piece of the Invitation 10 times before it is all boxed up. I count as I cut, adhere, finish, double check it’s perfect, and final time. There are many times in between each of those steps as well. I love it though. Weddings make me so happy! Share the love!!! 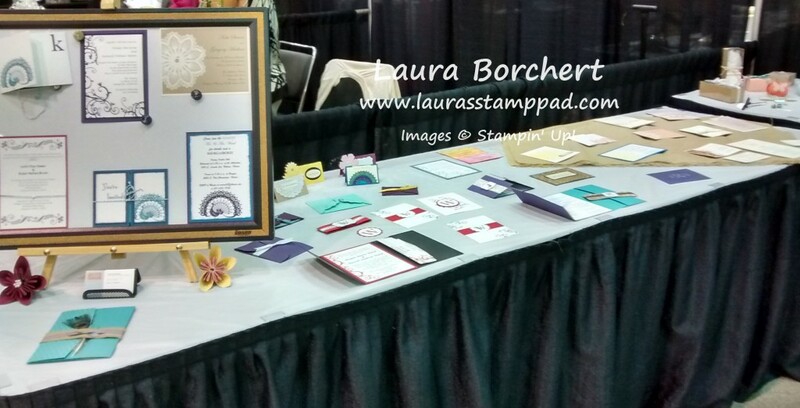 As many of you may know, I do wedding stationary as well as my Stampin’ Up business! You can check out some of my work here – Weddings.LaurasStampPad.com. I always forget to share some of my work on here but thought I would today. This is one of my favorites because you all know I love Bermuda Bay! Plus the colors and elegance are just amazing!!! For this invitation, I created a belly band with Gold Glimmer Paper and added some Whisper White Organza Ribbon over top. I used the Elegant Eggplant Re-Inker to dye the ribbon. When you have white ribbon and re-inkers, you have every color you ever wanted!!! TIP: Hot glue works best for adhering Glimmer Paper together since it is so chunky, most other glues don’t work well. I added the Monogram letter in the middle and punched it out with the Artisan Label Punch which was one of my favorites. It retired last year. 🙁 You could always use your favorite punch – circle, oval, scallop circle, Decorative Label Punch, or even Framelits! 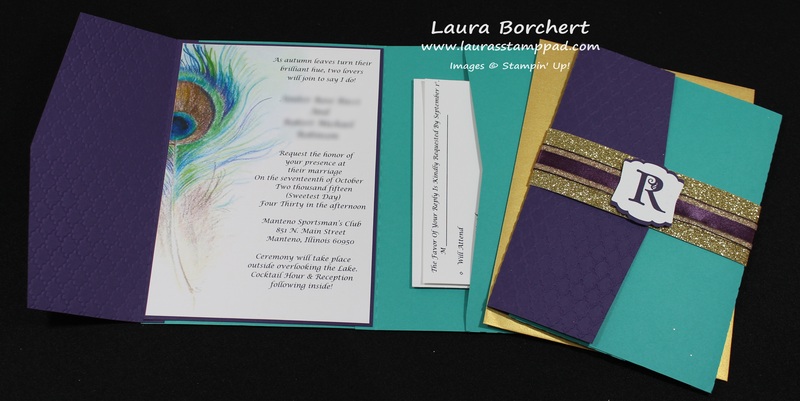 For the invitation base, I used Bermuda Bay and Elegant Eggplant. 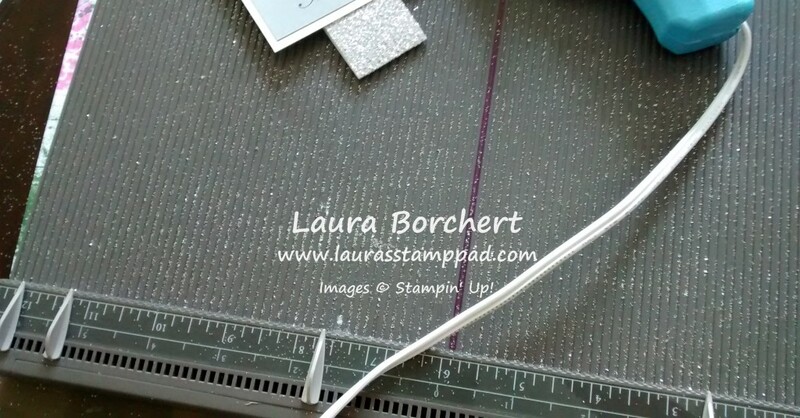 I even embossed the Elegant Eggplant flap with the Fancy Fan Embossing Folder to add a little texture! The feather on the inside was printed on a color printer but if you prefer a stamped image, the Perfect Peacock Stamp Set would be perfect! I really enjoy working with Brides to make their wedding day that much more special. I just love WEDDINGS!!!! Let me know in the comments below if you would like to see more of my wedding stationary posted on here! The Love Blossoms Designer Series Paper is so beautiful! The flowers, the simple patterns, the colors all are so perfect for so many occasions!!! Love it!!! I started with a Rose Red card base. I cut a piece of the Love Blossoms Designer Series Paper measuring 2″ and 5-1/2″. I layered it onto a piece of Garden Green measuring 2-1/4″ x 5-1/2″. I cut a Tea Lace Doily in half and placed it on the right hand side, tucking the end under the strip of Designer Series Paper. The greeting is from the Rose Wonder Stamp Set in Rose Red. PS: You NEED this stamp set. It has the perfect greetings for every occasion and the font is beautiful. Bonus, it has flowers in it as well! Perfect!!! 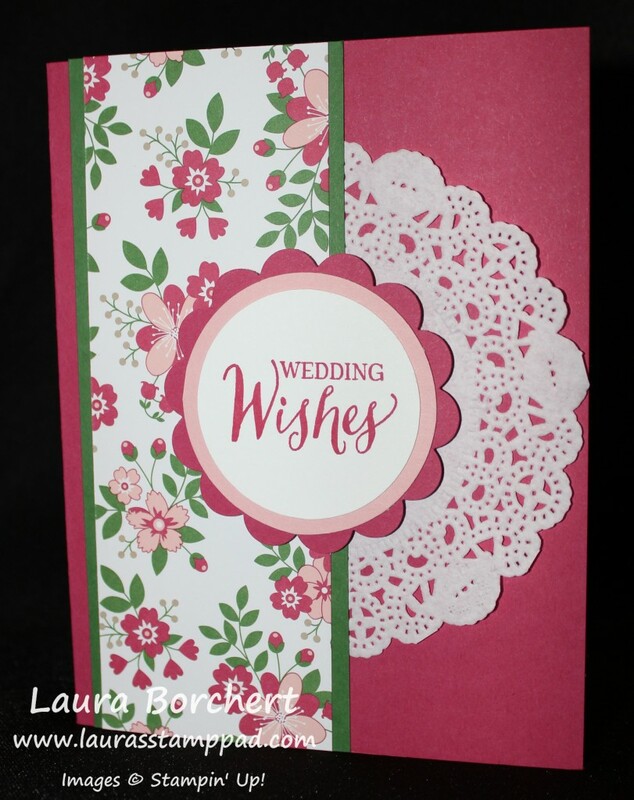 I punched the greeting out with a 1-3/4″ Circle Punch and layered it onto a Blushing Bride 2″ Circle Punch. Then I layered both of those onto a Rose Red 2-3/8″ Scallop Circle! I added the greeting to the card with Stampin’ Dimensionals….of course! 🙂 You can see more samples using this Designer Series Paper here! This card would work well for Valentine’s Day (13 days away), Birthday or Sympathy! Which greeting would you use? Let me know in the comments below! A Marriage Made In Heaven!!! Based on the title, you might think this is a post about my marriage but it’s not! 🙂 Hehe <3 Although I do think our marriage was made in heaven and blessed by God! 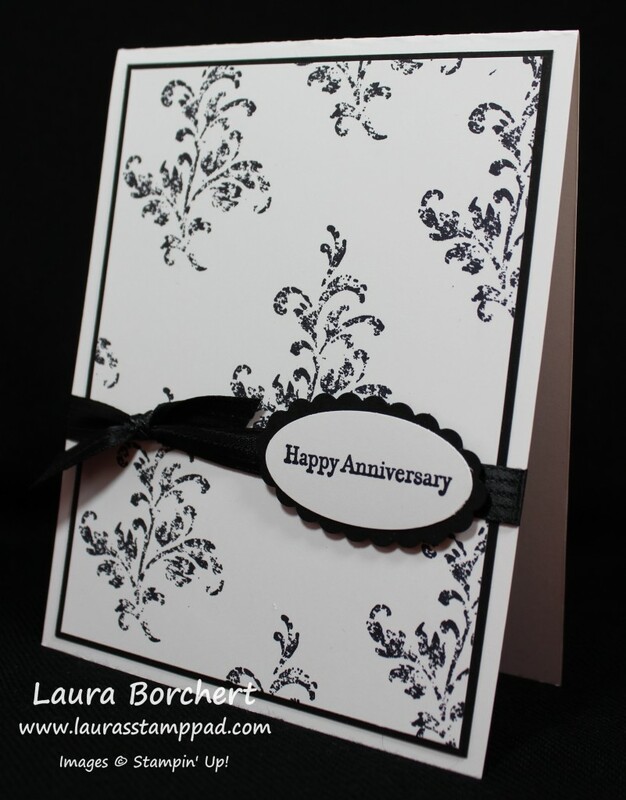 Instead, this post is all about this fabulous Wedding or Anniversary card! You could change up the greeting and make it into a Valentine’s Day card as well!! 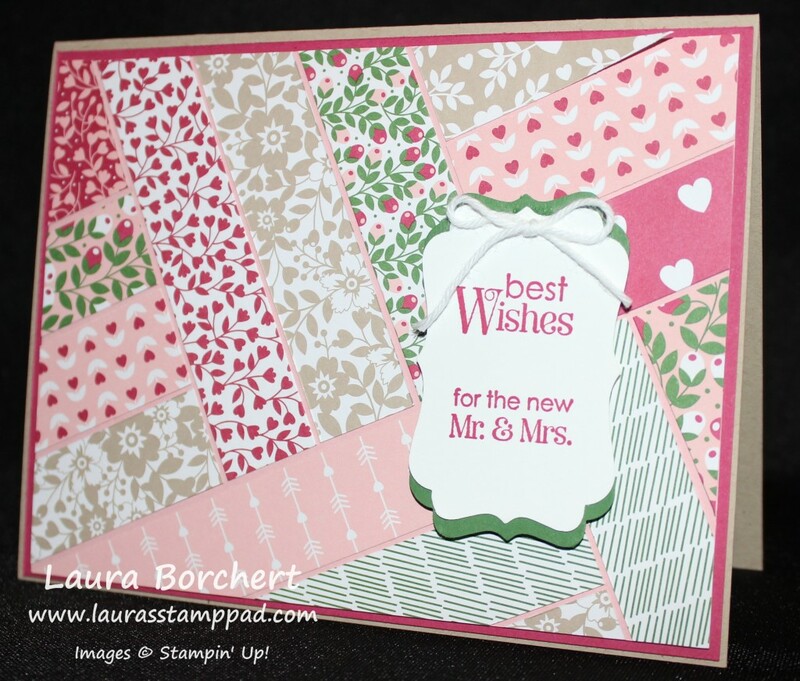 I used a Blushing Bride card base and a piece of Whisper White measuring 3-3/4″ x 5″! I took a few different patterns from the Love Blossoms Designer Series Paper Stack in the Occasions Mini Catalog and cut them into stripes measuring 2″, 1-1/2″ and 1″! I then used then Banner Triple Punch to add the beautiful banner tips! Then I staggered them along the piece of Whisper White. I stamped the greeting from the Blessed By God Stamp Set in Rose Red in the lower right corner. I thought it needed a little something towards the top so I wrapped some Gold Metallic Thread around the Whisper White a few times and then tied it into a knot. This adds a little shine and texture! To finish it off, I added a few sequins from the Metallics Sequins Assortment which has circles, hearts and stars. The hearts were perfect for this card! I adhered the sequins with the Fine Tip Glue Pen. You can check out a tutorial on that here! A card style like this is great to use up scraps of your Designer Series Paper and you could use this template for any card type. Have you tried this style yet?? Let me know what you think in the comments below! I have done lots of Quilted Cards in the past. You can check one of them out here! It is a great way to use up those little scraps that you have leftover after doing other cards! 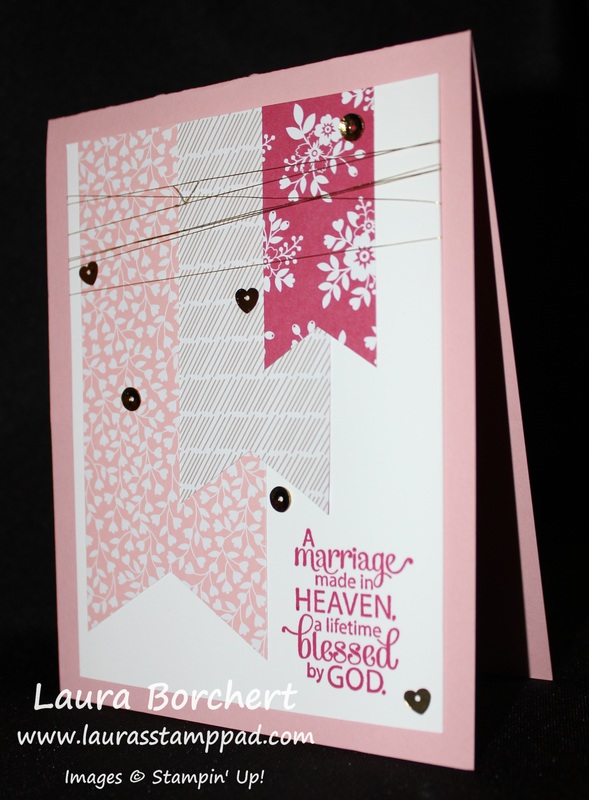 This card uses the Love Blossoms Designer Series Paper from the Occasions Mini Catalog! Let’s get started!!! I started with a piece of Blushing Bride cardstock measuring 3-7/8″ x 5-1/8″. I cut my strips of Love Blossoms Designer Series Paper into 3/4″ strips but you can do it with all different sizes as well. They can be any length. There are lots of different ways to create a quilt card. You can do either a “V” or an “X”, just diagonal stripes or the 3 strips like I did above! You will add adhesive to the back of your strip and then place it on your cardstock. It doesn’t matter where you begin, it can be in the middle or off to the side. For the one above, I placed one down and then 2 others, then turn and add 3 more strips. I placed a small space between each one but you can place them side by side too! There are lots of variations to this card and there is no right or wrong way. You will work your way out doing 3 strips and then turning after each section until you hit the edge. Once you have a few strips down, just trim off the ends and then re-use that strip in another section of the card. Once it was all complete, I added it to a piece of Rose Red measuring 4″ x 5-1/4″ and then placed it on a Crumb Cake card base! 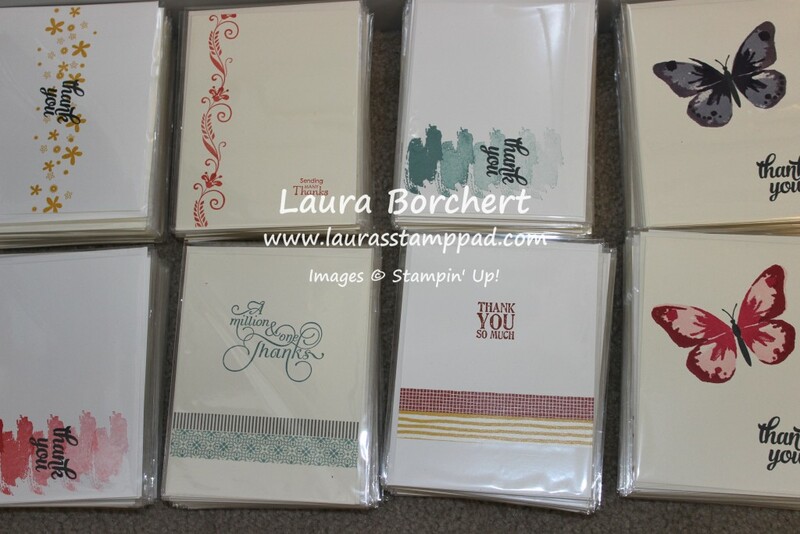 For the greeting, I used the Petite Pairs Stamp Set and punched it out with the Decorative Label Punch. I punched another one in Garden Green and layered it behind the greeting with this technique here! 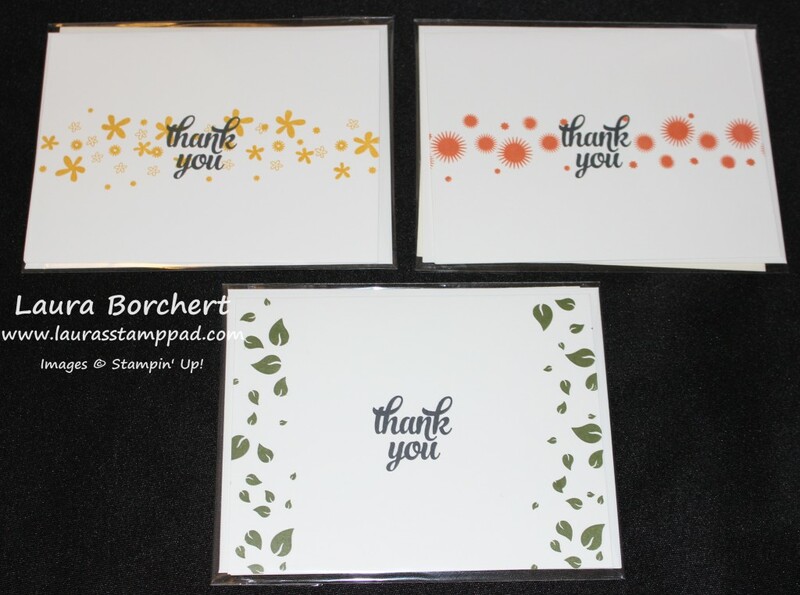 I added the greeting with Stampin’ Dimensionals of course! You can place it over any boo boos you made or over the center of your crosses or anywhere you would like! I thought it needed a little ribbon or something so I added a little Whisper White Baker’s Twine bow! I love it!!! If you would like to see this technique in action, check out my Video Tutorial below or by clicking here. Don’t forget to give it a thumbs up if you liked it!!! You all know how much I love weddings and even more when they are friends or family of mine! Today, I’m going to share with you my friend, Megan’s wedding which was this past weekend! I started working with Megan on the invites a year ago. 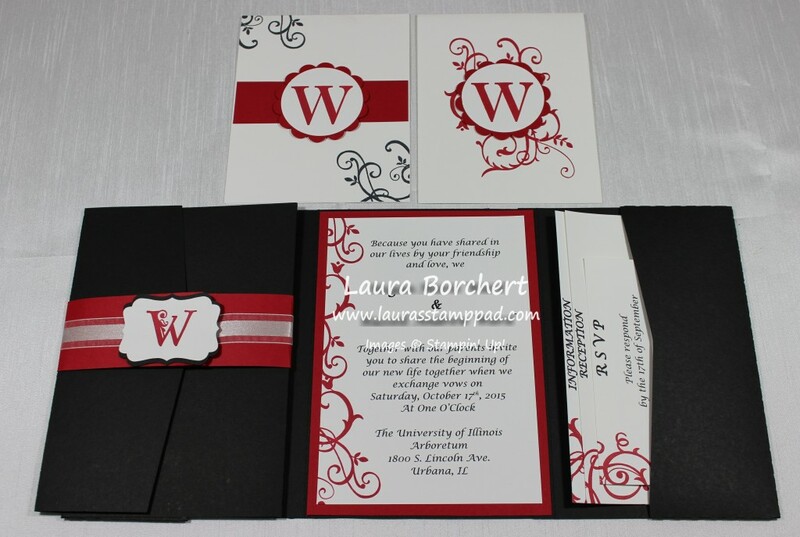 She knew exactly what she wanted after looking at a few samples of mine – Red, Black, and White and the pocket style invite! One of my favorite stamp sets – Baroque Motifs, which is retired, is one that I use a lot for wedding stationary. It is that perfect elegance to add to an invitation. You could also use the Flowering Flourishes Stamp Set. That image was stamped down the left hand side of the invitation as well as all of the cards in the pocket! I love how it all turned out! 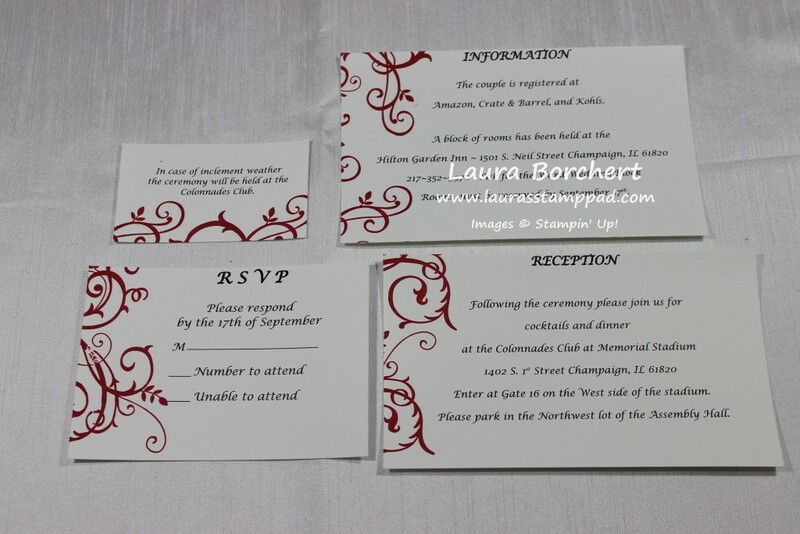 For the belly band to wrap around the invitation, I used Read Red cardstock with some Organza White Ribbon. Then I added the Monogram Letter to the middle after punching it out with the Decorative Label Punch! I love it! 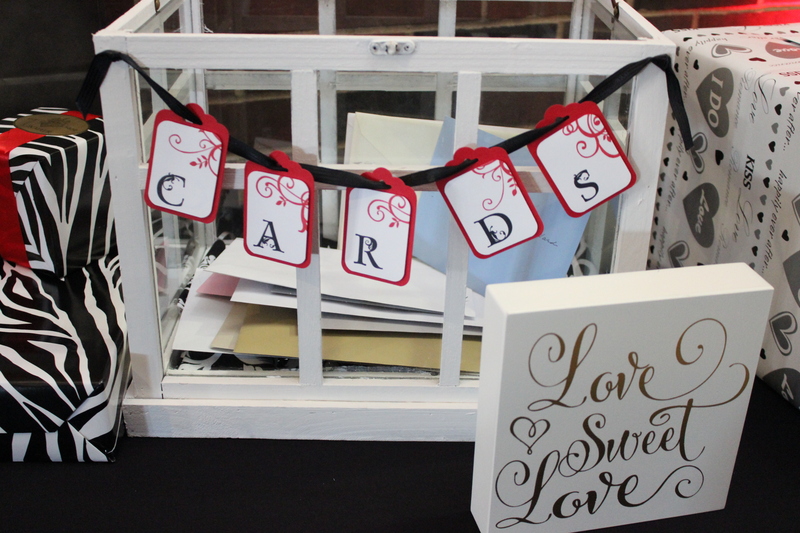 The two cards that are above the invitation were Thank You Notes that Megan wanted to match her Invitations. I simply stamped the baroque image in the center and added a monogram letter. The letter is punched out with the 2″ Circle Punch and layered onto the 2-3/8″ Scallop Circle Punch. A few days before the wedding, Megan reached out to me asking for a banner that said Cards to place on this box. She left the design all up to me. I decided to keep the theme going. I used Black Satin Striped Ribbon to hang each of the tags. Each tag was punched at the top with the Scallop Tag Topper Punch and rounded on the bottom with the Corner Rounder Punch! I layered a piece of Whisper White on top and stamped the letters and a little corner of that Baroque image. I love it! I used Mini Glue Dots to hold each of the tags in their spot on the ribbon! A few weeks before the wedding, Megan asked for more thank you notes because she was out of the ones from before. I asked what design she would like and she sent me a photo of fabric that was black and white stripes with gold dots all over. These are what I came up with! 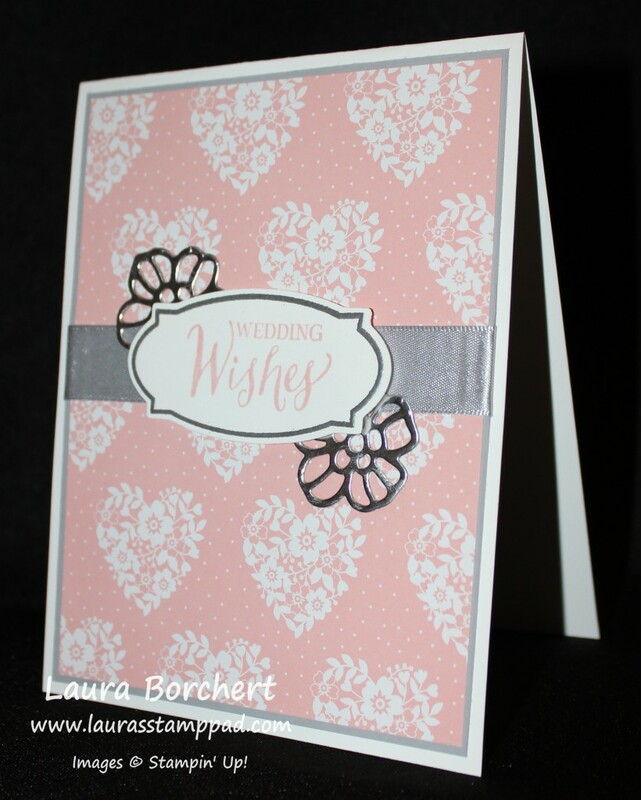 I used the Neutrals Designer Series Paper for the polka dots and stripes onto a Whisper White card base. Then I added various sizes of circles punched out of Gold Glimmer Paper! The greeting is from the One Big Meaning Stamp Set! She loved them and ended up asking for more so that she could use them for wedding stuff and after! After all of those circles and dots, I couldn’t stop myself and so I created this wedding card for the fabulous couple. I used some leftover scraps from the Neutrals Designer Series Paper, Real Red cardstock, and Silver Foil Paper! I loved it! The greeting is from the Blessed By God Stamp Set! I love how it all turned out and it all came together perfectly! Megan, the bride, loved it all and was really excited each time I created another piece for her! It makes my heart happy when I can help a Bride create the wedding of their dreams. You can check out some more of my work at Weddings.LaurasStampPad.com. If you are getting married or know someone who is, feel free to pass my information along. I can work with any budget and create according to the wedding colors and theme! All of these Thank You notes were created for my Bridal Fairs!!! We all know that when planning a wedding, there are many times when you need a Thank You note so I pass these out with my contact information to all of the Brides! It is a Thank You for stopping by to see me and also a gift that they can use as well! Since I am making hundreds of these cards, I need them to be very quick and simple so here they are!!! This is a simple Whisper White card base measuring 5-1/2″ x 8-1/2″ and I stamped the Work of Art image down the right hand side. I inked it up once and then just kept on stamping to achieve that Ombre look! The greeting was stamped in Black from the Tin of Cards Stamp Set! This card base measures 4-1/4″ x 11″ (cut in half the other way) and I stamped the image from the Flowering Flourishes Stamp Set on opposing corners! Again, I used the greeting from the Tin of Cards Stamp Set! Okay, I will admit that this one wasn’t all that quick since it is a 5-step stamping routine for each butterfly but when making multiples it really did go fast and wasn’t all that bad! I used the butterfly from the Watercolor Wings Stamp Set and the greeting from the Tin of Cards Stamp Set! You can check out color combinations and some tips for stamping the perfect butterfly here! Happy Friday!!! Woot Woot for the weekend!!! I plan on playing with all of my Holiday Mini Catalog goodies that arrived this week. I love getting to pre-order them as a demonstrator!!! Remember that if you just can’t wait till September 1 to get your hands on those Holiday Mini items, you can join Stampin’ Up and add those items to your Starter Kit!!! 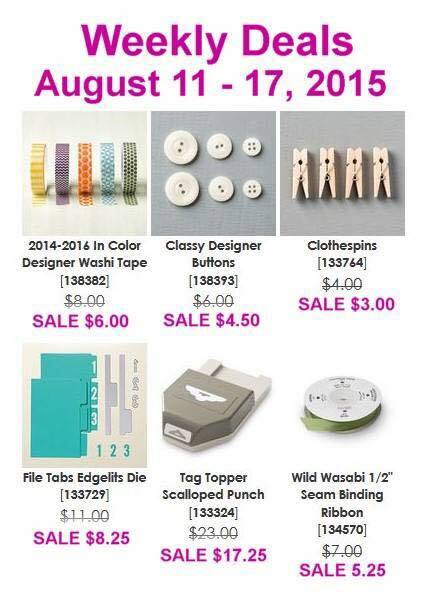 Pick out $125 in any product you wish and pay just $99 plus tax, free shipping!!! There are no obligations as a demonstrator to do anything after that just enjoy the goodies and have lots of fun!!!! Click here to learn more! Be sure to stay tuned to my YouTube Channel and Facebook as well so you can see sneak peaks, reveals and more!!! What is a Friday without the Weekly Deals?!?!?!?! I love the Tag Topper Scalloped Punch and have used it for tags, bookmarks, and even on my cards!!! You can check out some of my samples here and here! Also, check out that Washi Tape and think about the upcoming months!!! Yep, that 2014-2016 Designer Washi Tape is perfect for Fall cards!! Stock up now while it is on sale! Here is a picture from the Bridal Fair that I attended last weekend!!! I had lots of fun chatting with Brides about their upcoming weddings! Oh how I love weddings! 🙂 You can check out some of my Wedding Stationary work here and let me know if you are getting married or planning a wedding!!!! Have a wonderful weekend and see you back on Monday!! !